Folks, This items has got no direct relation to my Mahindra Classic restoration project but It is a essential tool for person like me with a Jeep(apologies for being too lazy not being able to manage the manual jack), This item attracted me while browsing for a better tyres. I have taken this hydraulic bottle jack as to find a permanent place in my jeep, probably need to make some locking facility somewhere in the body tub for this jack with tinker's assistance. 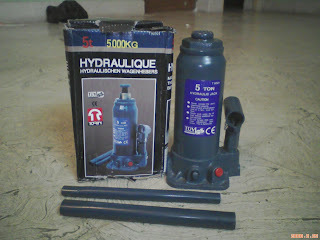 The Hydraulic Jack which can lift upto 5Ton weight, If you looked at my previous blog about the spares that I have collected you would have noticed another Jack which is fully manual. I may sell the other one for a good deal if someone is interested. 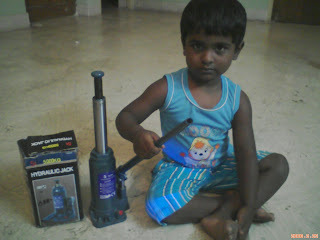 The above picture shows my 3 year old son with lifted height of the jack, the operations of the jack is so easier as my son can manage himself, though it is not a children toy. I am in Thiruvanmiyur. Dont know much technical about automobiles. But love to drive and see them in action. Am looking forward to see you on road with the CLASSIC. It is learning for me , about the Jeep , when I go through your journal. Ranjit, Thanks for your continued support. The jeep is shaping up well and now the body tub has been moved to the chase and metal pasting is in progress. Hope to see you soon. Hello, I love reading through your blog, I wanted to leave a little comment to support you and wish you a good continuation. Wish you best of luck for all your best efforts. Hydraulic Jacks, Hydraulic Power Pack. I read your blog and get and interesting information. Thanks for sharing this.